ROMAIN JEROME - Tourbillon Steampunk "A la Grande"
Setting the crowning touch to the success of the new self-winding Titanic-DNA watches revisited in grand style, or A la Grande, Romain Jerome presents an original creation, the Tourbillon Steampunk A la Grande. 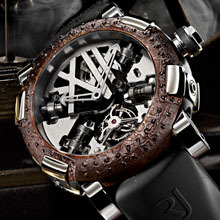 Within an exceptional timepiece featuring intensely accentuated physical characteristics, brand CEO and designer Yvan Arpa has brought together distinctive bolts, an anchor-shaped off-centred oscillating weight, 6-sided screws, Roman numerals, characteristic paws, a tourbillon, the collection’s trademark rust, along with a number of springs and rivets…. The result is a fascinating blend of apparent anarchy and undeniably noble charm. The Tourbillon Steampunk echoes the A la Grande  design of the Titanic-DNA collection and features a generously sized 50 mm-diameter case that reaches a full 53 mm including the screw-locked crown or the paws. The latter come in steel, ceramic or 5N pink gold depending on the model, and are applied to the entirely riveted oxidised bezel. Fashioned using 80 rivets hand-applied by the watchmaking craftsmen of the Maison Romain Jerome, the latter is inspired by the hull and the boiler room of the famous ocean liner. The dial-free Tourbillon Steampunk proudly displays its personalised RJ 2 movement exclusively developed by Concepto and decorated in harmony with the collection signature features. The transversal cross is symbolised on this model by four bolts (including two mounted on springs), vividly evoking watertight hatches used in the marine world. The 12 o’clock Roman numeral in satin-brushed and bevelled steel makes a striking contrast with the mirror-polished finish of the mainplate and the tourbillon carriage bridge. The rear of the movement features an off-centred bidirectional oscillating weight shaped like a ship’s anchor. *The rusted steel horological creations in the ‘Titanic DNA’ series  features an oxidized steel bezel which is the result of an extraordinary blend of authentic steel from the wreck lying 3840 meters under the sea, and from the Harland & Wolff shipyard in Belfast, where the Titanic was constructed nearly a century ago. Official certificates of authenticity guarantee the origin of materials used.